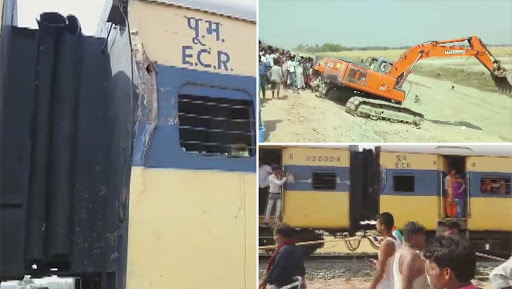 Vaishali, April 14: In a shocking development from Bihar, Barauni-Sonpur passenger train collided with a poclain machine near Sahadai Buzurg railway station in Vaishali district on Sunday Morning. According to reports, the poclain machine failed to yield to a passenger train was stuck broadside and damaged the train. Bihar: 3 of Family Killed as Train Runs Over Them at Islampur Railway Station. In the incident, no casualties were reported. The visuals from the incident spot of the train collision were shared by news agency ANI, which also tweeted pictures from the rescue operations. In the picture, scratch marks can be seen with a heavy dent on one of the compartment. Earlier this month, around eight railway staff, personnel of the inspection car (tower van), were injured when an EMU local train dashed against a stationary inspection car near Srirampur railway station in West Bengal on April 6. The train from Howrah was moving towards Srirampur station, where the home signal was red, but the train overshot it and collided sideways while crossing the stationary inspection car at a crossover of tracks.